I don’t know about you, but everywhere I go I’m being bombarded with Halloween and pumpkin recipes. They’re everywhere. Even though it’s still three weeks till Halloween. We’re not used to that here in Germany, because we skip Halloween and immediately pretend that Christmas is just around the corner. Even though it’s still two months and two weeks ahead. Seriously, what’s up with everybody?! I’m still hoping for a warm autumn day and it’s not even cold enough to dig up your cozy winter jacket, and there’s Christmas decoration everywhere! Not that it really gets colder on Christmas that it is now. I can’t remember the last time we had snow over the holidays. Even if there IS snow in winter over here (usually there’s just wet dark grey snow-mud) it always manages to avoid the second half of December. Like a malicious hermit that was bullied in the past and now wants to prevent every kid in Germany from being happy and having a beautiful white Christmas with snowmen and snowball fights. Kind of like the Grinch, actually. Well, I have to admit that I purchased a package of gingerbread with jam a few weeks ago (yes, Christmas was in supermarkets exactly on the 1st of September), but immediately after that, I hurried to grump again about all the people buying Christmas stuff already. 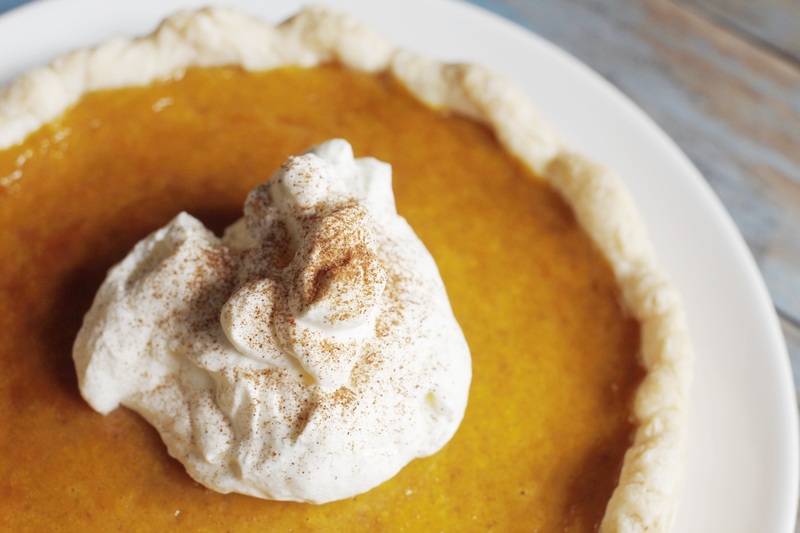 Anyway, I have actually never made and EVEN tasted pumpkin pie or anything sweet with pumpkin before, because you simply can’t get the ingredients (pumpkin puree and pumpkin pie spice) here. But this year, I decided to let go of the excuses and just make a pie completely from scratch. So I baked, skinned, pureed and drained some pumpkins and made pumpkin pie spice (after a description on Wikipedia. That’s right. Wikipedia.). I had expected the spice to taste a little like Christmas, but to be honest, I was overwhelmed by it tasting COMPLETELY like Christmas. And by me, baking something that tastes like Christmas in mid October (see above). 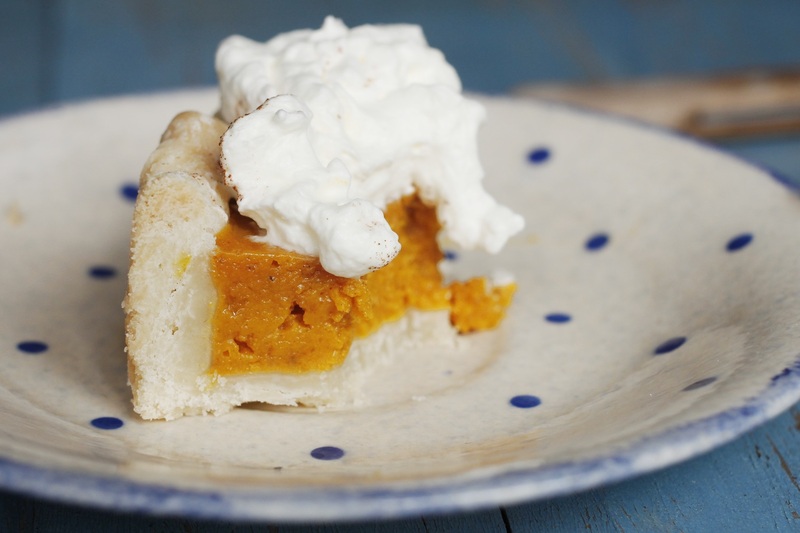 But once the pie had been in the fridge over night, the spice blended in very well and harmonized soo perfectly with the creamy pumpkin and the crispy crust (and the whipped cream) that I couldn’t stop eating the pie. 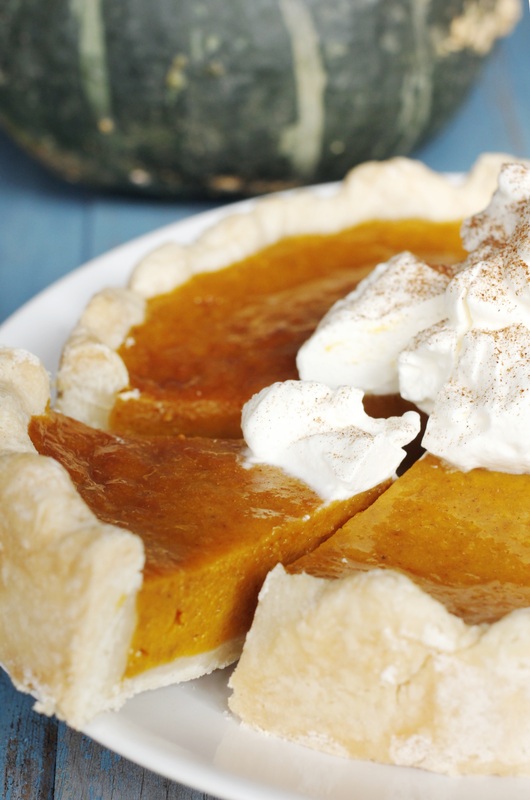 When I was cutting an additional slice, I caught myself telling the pie „I just can’t get enough of you.“ Not joking. Seriously, what is wrong with me? I’m already talking to the things I bake. Perhaps I should slow it down a bit. I made Pioneer Woman’s Perfect Pie Crust. It really is perfect. I confess, the crust looks way too thick. But I liked it, because it really tastes great. 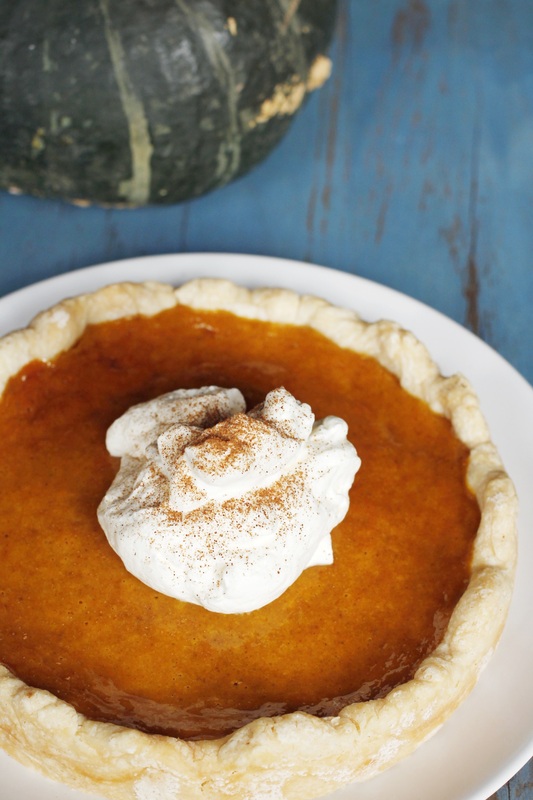 It goes so well with the creamy pumpkin filling… Also it looks so thick because it’s a mini pie and yeah. Whatever, it was good. This is my homemade pumpkin pie spice. It’s two parts freshly ground nutmeg, one part ground cinnamon, one part ground ginger, one part ground cloves, one part allspice (or Piment, as it’s apparently called here. 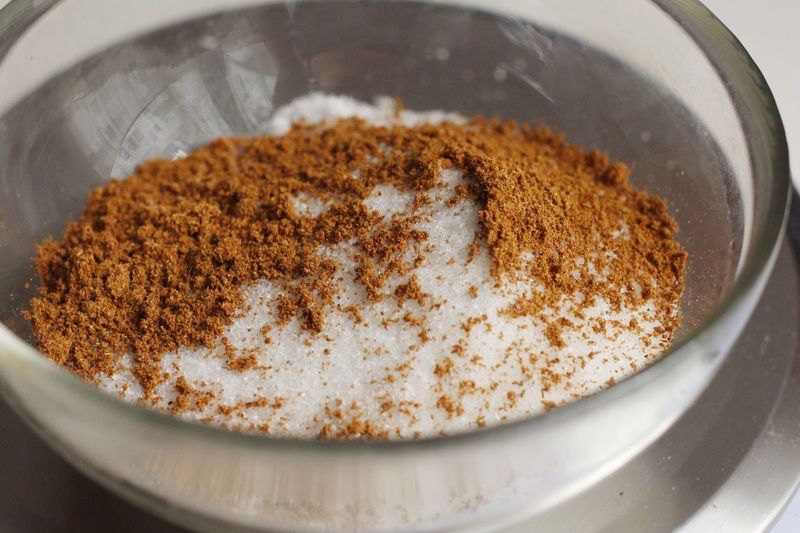 All the time I thought I could never make authentic pumpkin pie spice at home because I thought allspice was some magical American ingredient…) and one part ground cardamom (it’s optional though, I think. But I love cardamom). 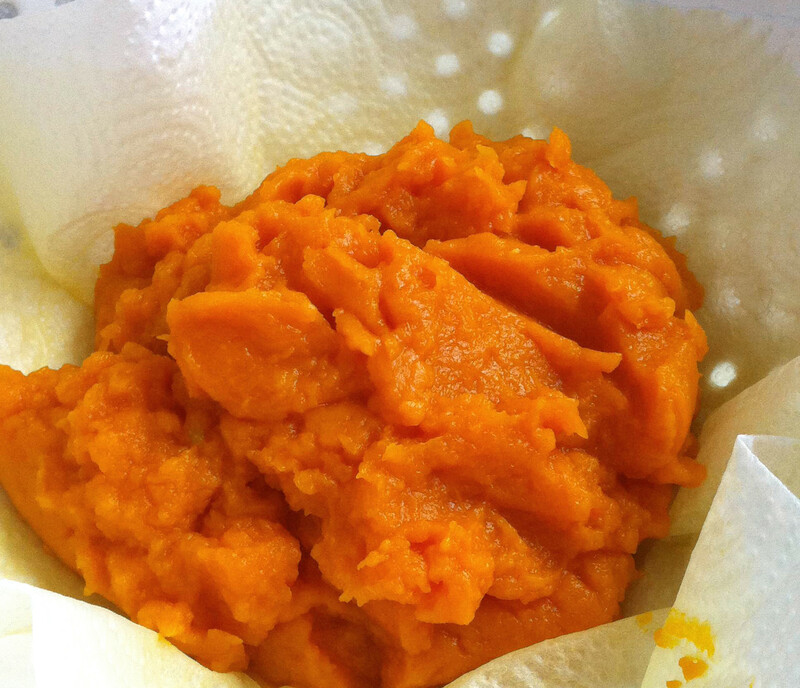 You mix sugar, spice, a little salt, an egg and the pumpkin puree (if you can find canned puree, go ahead. But I couldn’t. And I liked the challenge. ), then add the sweetened condensed milk. 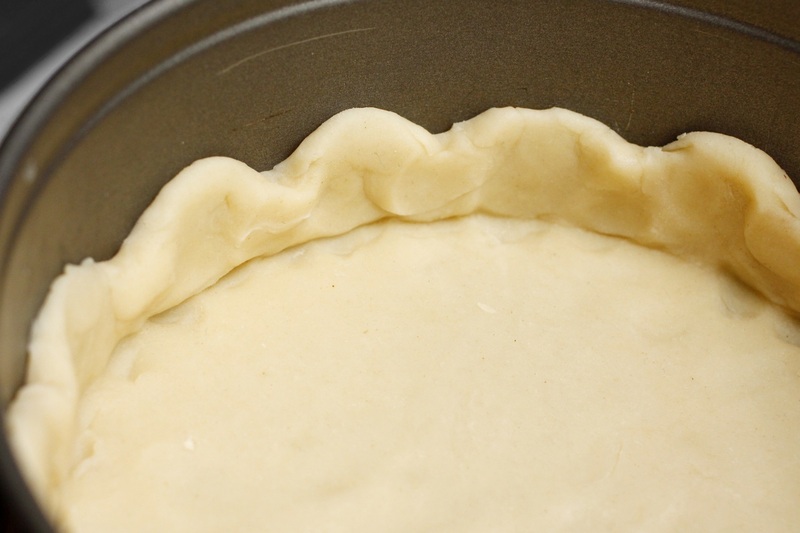 Pour the mixture into your pie crust and bake the thing. By the way: I got two small pies out of the recipe. But you’ll get one small pie if you aren’t as scared as me of putting too much mixture on a pie, and if your crusts go higher up the pan than mine. I’ll just make only one, the next time, too. Which will be pretty soon, probably. 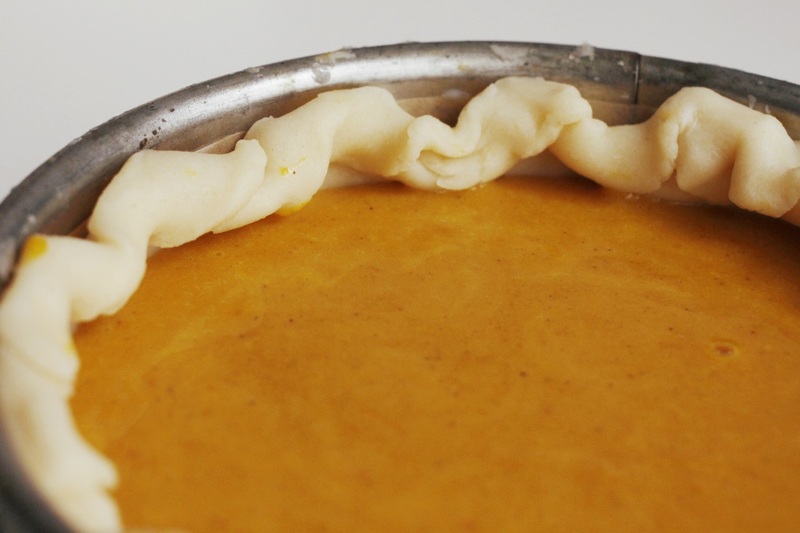 Now to the hardest part: Let the pie cool down and then pop it into the fridge overnight. Please, just do it. It will taste so much better. 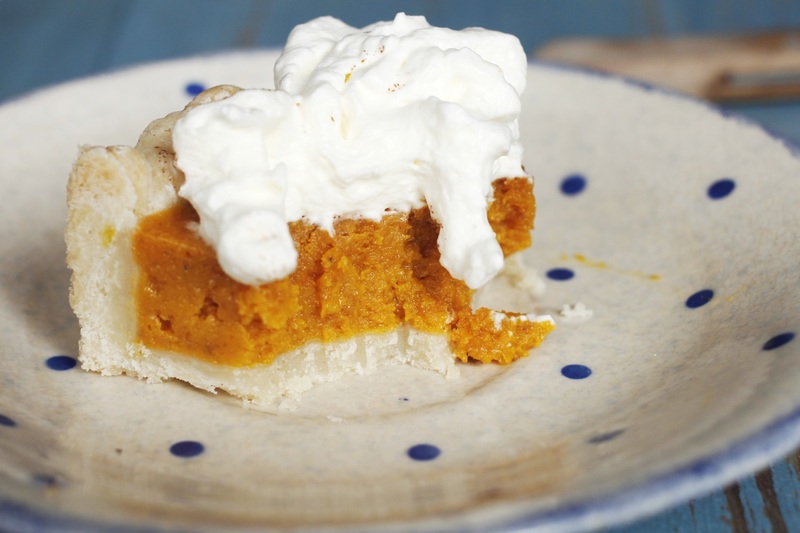 Whip up some cream, put it on top and dig in. 170ml sweetened condensed milk Preheat your oven to 180°C (350°F). Combine sugar, salt and spice. Beat the egg, add the pumpkin puree and beat on. Add sugar and spice mixture and beat to incorporate. Add the condensed milk and beat for about one minute. 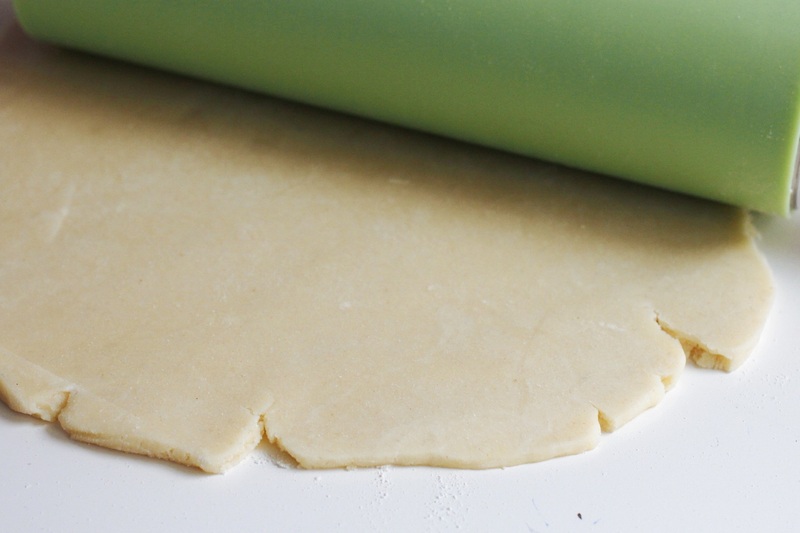 Fill it into your pie crust(s) and bake for about 35 minutes, or until a knife inserted in the middle comes out clean. Make sure to keep an eye on the pies, they might be done earlier or you might have to keep them in the oven for a little while longer. 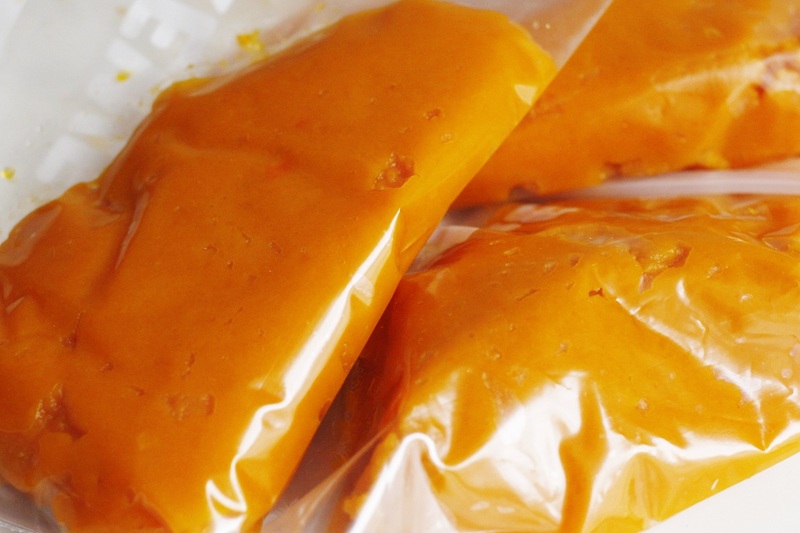 Let cool and put into your fridge overnight. 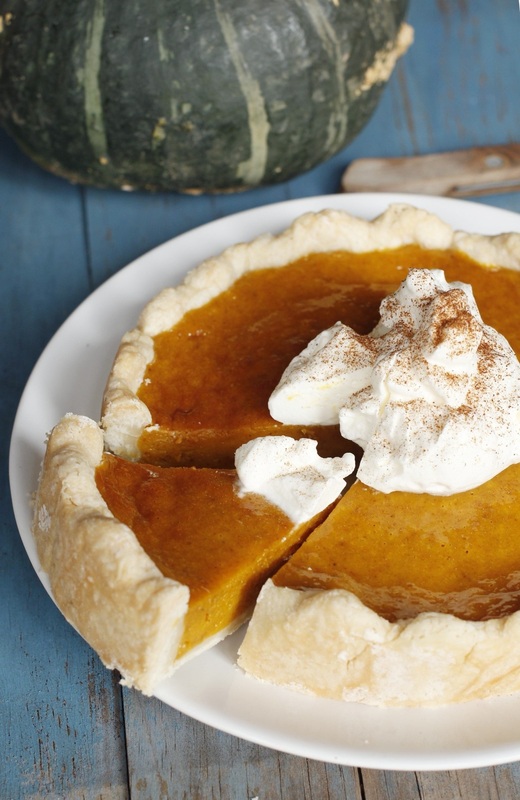 Serve with whipped cream.If you intend to double the recipe and make a big pie, bake it at 220°C (420°F) for 10 minutes, then reduce the heat to 180°C (350°F) and bake for 40 minutes. Check some time before, it might be done earlier.